If you’re lucky, the best cup of joe is right around the corner. You can pick up your brew and a dozen to go. 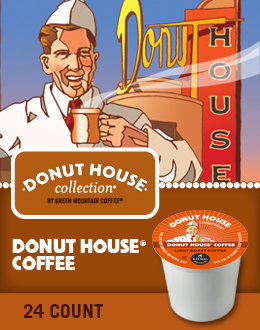 The rest of us rely on the Donut House Collection® — Coffees with rich, bold flavor and a little kick to get you going. Good, straightforward coffees that will remind you of the days when you knew what to expect and were never disappointed. This product is certified kosher by the Orthodox Union. Soft, caramel-like aroma with hints of milk chocolate and toast. An uncomplicated cup, medium body, flavor notes of cedar, caramel, nut and orange-toned citrus. Sweetness carries into the mildly nutty finish, with distant suggestions of molasses and chocolate.